Full Professor Suzanne Rivard was elected as a Fellow of the Association for Information Systems (AIS), at the International Conference on Information Systems (ICIS), held in Texas from December 14 to 16. This is one of the highest distinctions in the information technology (IT) field. A pioneer in many areas and an avant-garde researcher, Professor Rivard is now a world-renowned figure in IT. She is highly influential in all fields of expertise that she has developed over the course of her career, in particular risk management for IT projects, contracting out, business process transformation, and IT implementation and strategic management. 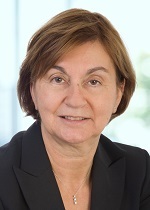 She currently holds the Chair in Strategic Management of Information Technology and is a member of the Research Group on Information Systems (GReSI), Associate Editor of the Journal of Management Information Systems and the Journal of Strategic Information Systems, and Senior Editor of MIS Quarterly Theory and Review Department. Our sincere congratulations to Professor Rivard on her outstanding contribution to the development and advancement of the IT field!